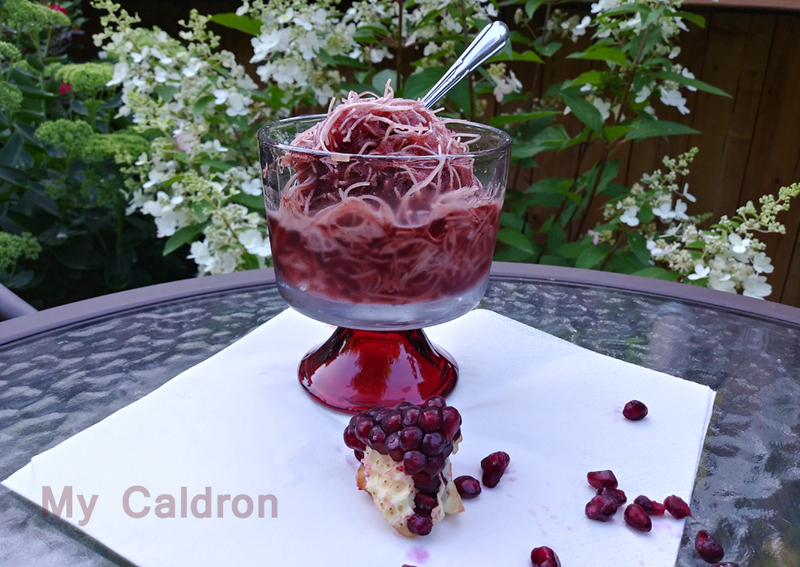 Recently, on a hot humid days in Montreal, I was privileged to entertain a large group of my family with good food, scented shades on the porch, open heart, and most impressive of all, with homemade faloodeh Shirazi (pomegranate faloodeh in this case). Faloodeh or paloodeh فالوده، پالوده is a refreshing iced dessert, a summer savoury, made of frozen cornstarch, water, sugar and rosewater. Like Salad Shirazi, Faloodeh Shiraz is a speciality of my old hometown Shiraz. The dessert is of course popular nationwide and is almost always made from the scratch in ice-cream stores and sold in small washable or disposable cups. In Shiarz alone faloodeh is enjoyed with few drops of either flower syrup or lime juice sprinkled on it; everywhere else people eat it with or without lime juice. 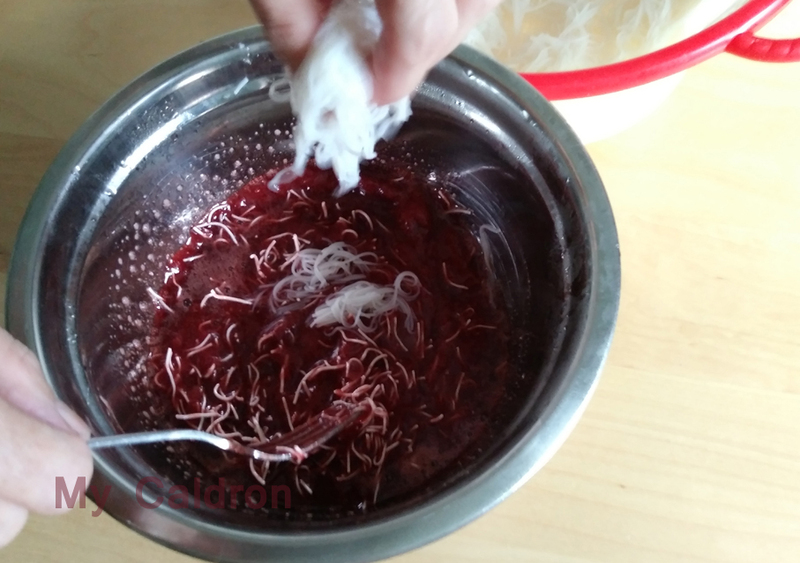 In the absence of the skills and resources necessary to make an original faloodeh with cornstarch, the Iranian expats have developed this simple yet quite genuine method to duplicate this delicious dessert by replacing packaged Chinese rice noodles with cornstarch. 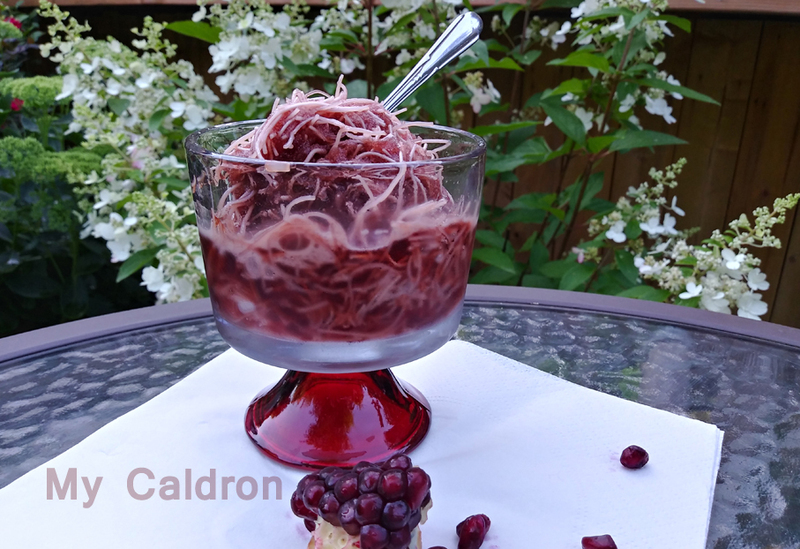 Now, a more delicious (and less known) version of white plain faloodeh is pomegranate faloodeh in which pomegranate juice is simply replaced with water. 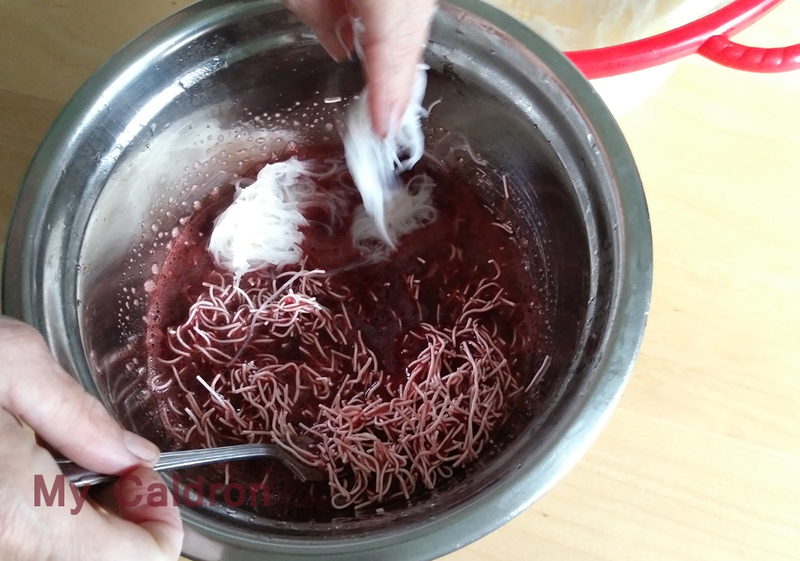 I have come up with the following recipe after trying many plain faloodeh recipes on the internet and modifying both the amount of ingredients suggested in these recipe as well as the method employed. 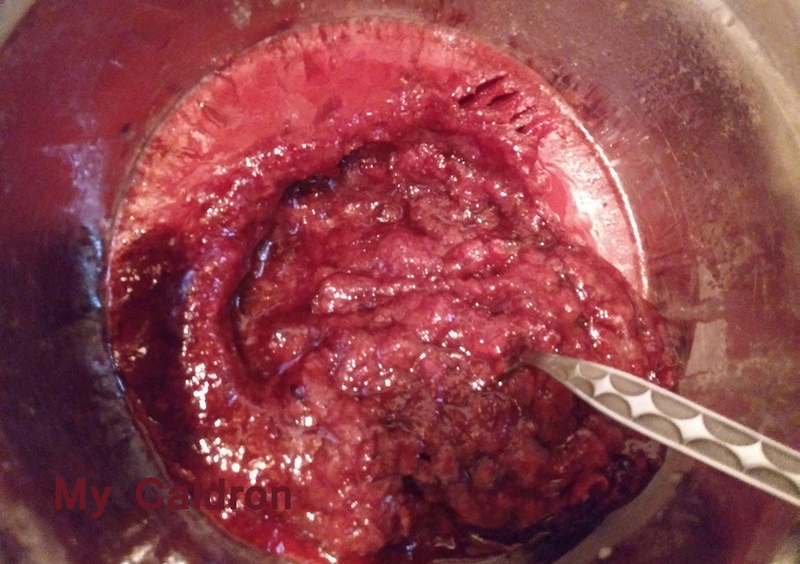 In a medium size pot, pour the pomegranate juice and stir in the sugar. Mix well, then place on medium heat and continue to stir for 10 minutes. Let cool, then add in rosewater. 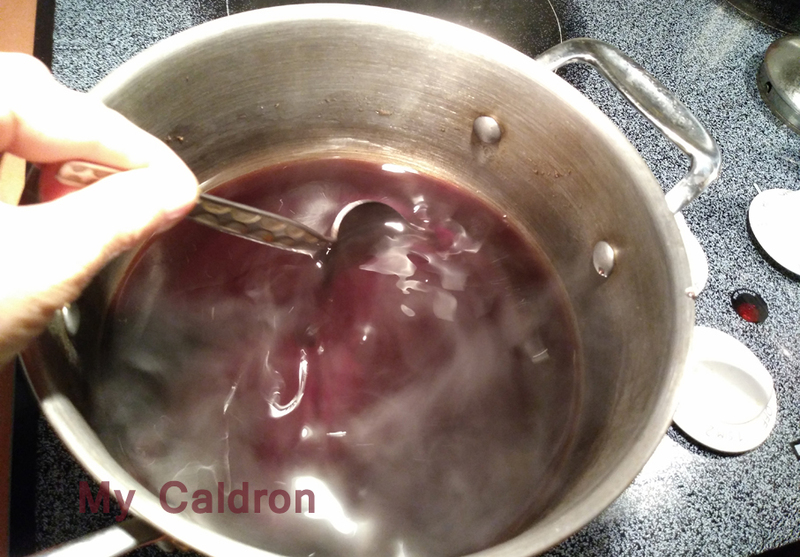 Transfer the syrup from the pot to a baking bowl and place in the freezer for 4 hours. A deep freezer would be a better choice for our purpose than a fridge freezer. Stir the mix after 1 hour, and later on, after 2 ½ hour so that the syrup won’t turn into a solid bulk. While waiting, once you get closer to the end of the 4-hour-freezing period- get busy with preparing your noodles. Using your hands or a scissors cut noodles into 1 inch pieces. 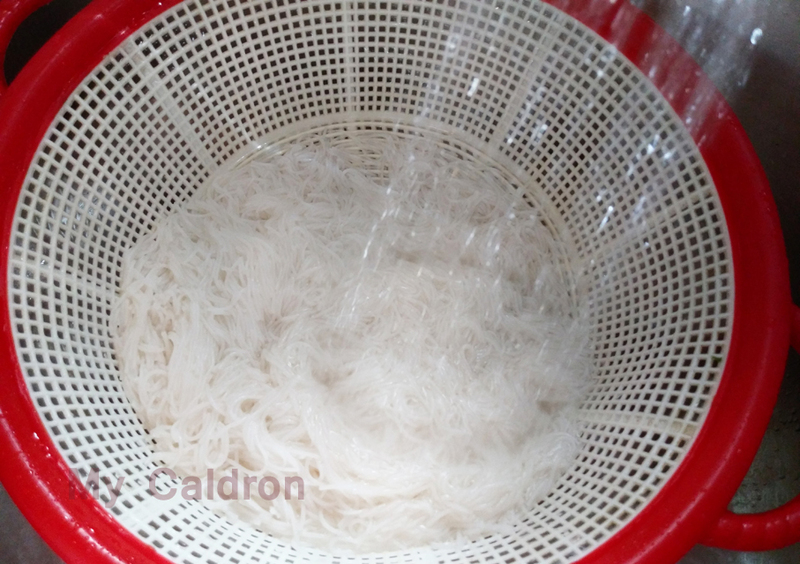 Keep the operation inside a big bowl to avoid wasting flying noodles. In the same pot you used to make liquid mix, pour in 3-4 cups of water and bring to a boil. 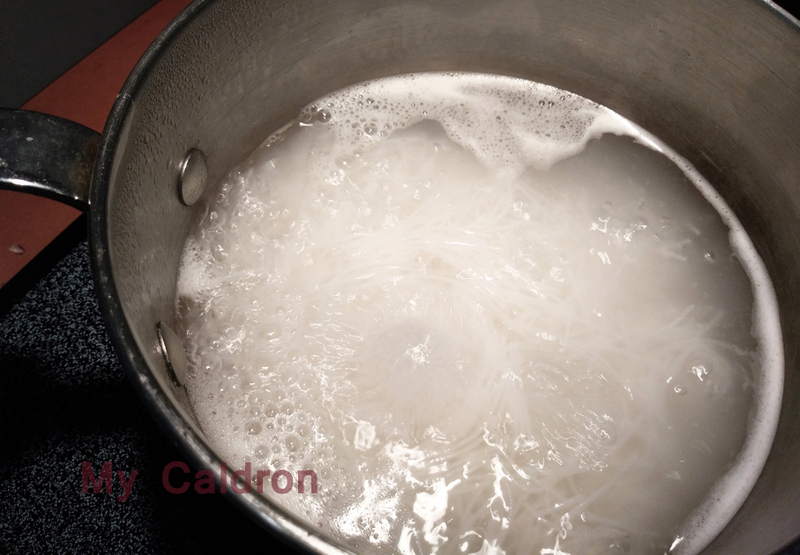 Add in the noodles and let it boil for 10-15 minutes (although the rice noodles we are using are most pre-cooked we do need to further cook them). Drain in a colander placed in your kitchen sink and rinse with cold water for a good minute. Shake and let the excess water drain. Four hours after you placed your syrup in the freezer, take it out and stir with a fork. Even if the content is not solidly frozen it should still be frigid enough to do the trick. 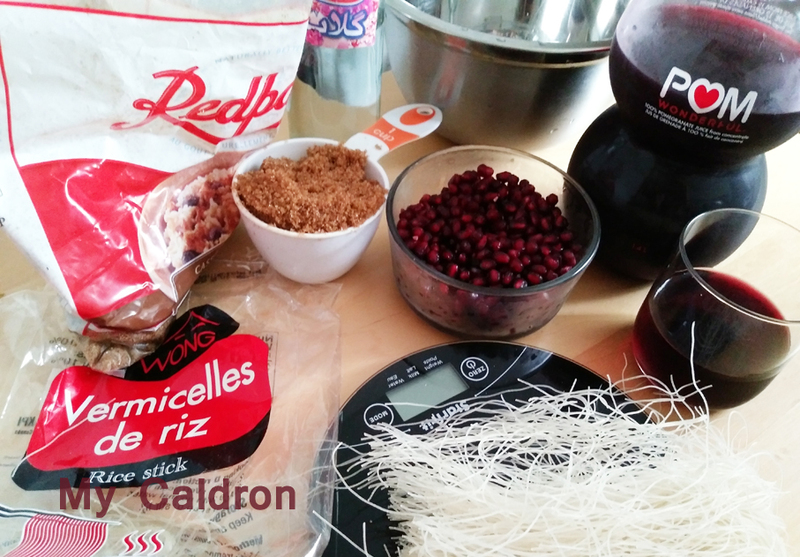 Swiftly add the noodles in the bowl – little by little while you continue to gently stir the mix. This is the magical moment! Noodle pieces become stiff and crispy seconds after they come into the contact with the frigid environment in the bowl. Your faloodeh is almost done! Just take the bowl back to the freezer for another hour or two before taking it out again and serving in small dessert bowls. 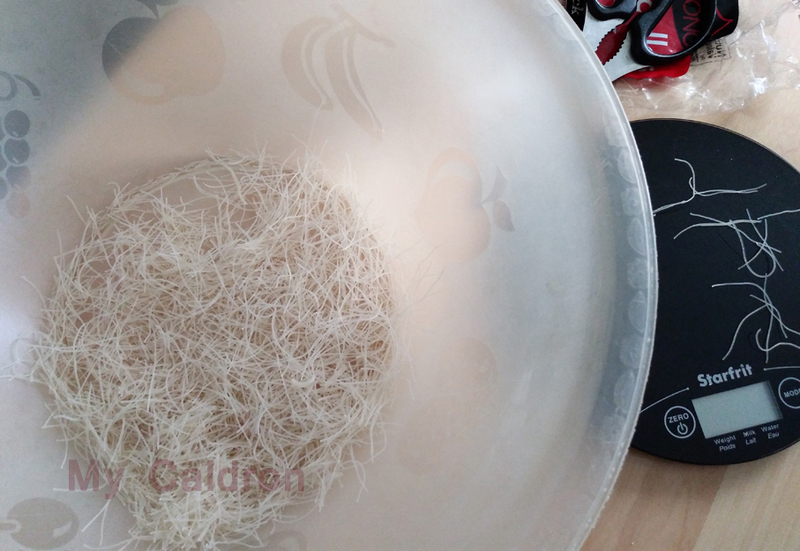 To serve, you should be able to take break through the big bowl of faloodeh with a fork without too much difficulty: This is how cold and solid your serving faloodeh should be: not too runny, nor too frozen. Finally, you could keep your faloodeh in a sealed bowl in the freezer for up to a week. In this case, thought, you should place it in room temperature for 15-20 minutes before serving. Hope you will try and enjoy this delicious Iranian dessert before we are out of the hot summer days and of the fragrance of flowers on our porches !